As opposed to a Colorado or Minnesota driveway huh? Throw in folks in Buffalo too. It's starting to snoooooooooow !! Also, very disappointed in the snow accumulation so far, I hope we get much more. I appreciate his dedication but no, not really a fan. I realize he is the way he is and he can't help that but I can't take more than 20 seconds at a time of his excitedness. 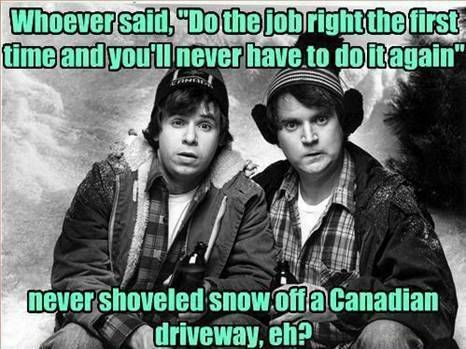 You sound like a snowmobiler, skier or a plow operator wanting all that snow to fall. Have you seen our local internet weather guy? I know him. He's even more interested in weather than I am. You think you can but it just makes you look like a jack*ss. You are suppose to lead by example, unlike the previous owner. Budgetman, I have to issue you a warning. That controversial post of yours had way too much of a gap. It made me scroll too much! !